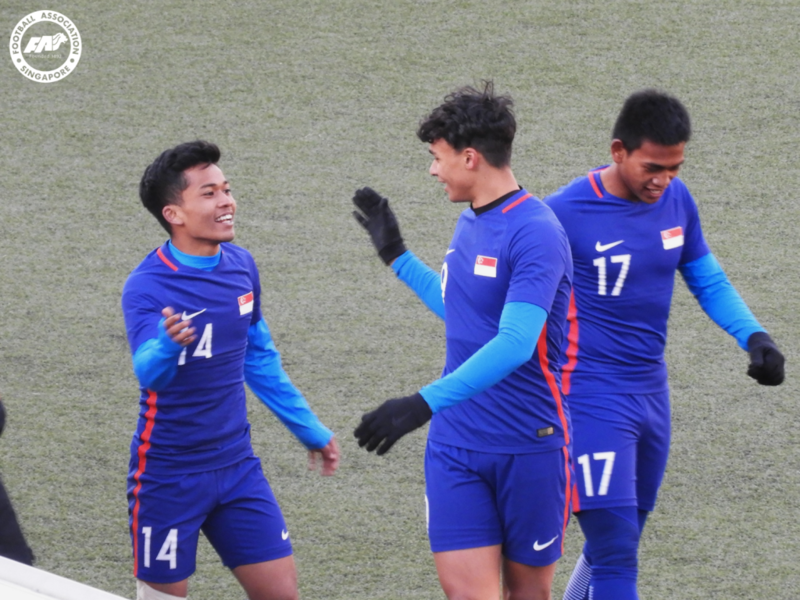 ULAANBAATAR, 26 MARCH 2019 – Singapore finished their Asian Football Confederation (AFC) Under-23 Championship qualifying campaign on a positive note after a 3-1 victory over Mongolia on Tuesday evening. Fandi Ahmad’s U22 charges gave their all in their final Group G match against the hosts and displayed great spirit to come back from conceding early on. Looking to avoid a third straight defeat, Mongolia came charging out of the blocks and broke the deadlock on three minutes through a deft header from Batbayar Khash-Erdene. But Singapore soon began to stamp their mark on the game and the lively Hami Syahin flashed a 20-yard shot not far off the top left corner on 12 minutes, before the Mongolians hacked away Joshua Pereira’s low ball two minutes later with Ikshan Fandi lurking. Hami should have perhaps done better on the half hour, though he was off balance while shooting over from close range. Mongolia did see a goal ruled out for offside in the 17th minute but it was all Singapore otherwise and the equaliser deservedly came on 33 minutes. Hustling down the left, Hami skipped away from an opponent and whipped in a pinpoint cross from Amiruldin Asraf to deftly flick in at the near post from six yards. Encouraged, the blue tide poured forward and were rewarded a minute before the break. From the right, Syahrul Sazali floated a free-kick to the far post, where Irfan Fandi rose like a salmon to thump home a header. His brother Ikhsan could have made it three just a minute into the second half, but saw his effort from a tight angle blocked after Hami had played him in. Sanchir Anand would deny Ikhsan again 11 minutes later, parrying the ball away after the striker had played a neat one-two with Syahrul. Remarkably, the Mongolia goalkeeper would thwart Ikhsan for a third time late on after he somehow got a fingertip to the latter’s shot, having already been rounded by the Singapore number nine. The home side then enjoyed a good spell of pressure and would have levelled had it not been for Zharfan Rohaizad, who got his hands to Altansukh Temuujin’s long-range effort before pulling off a brilliant point-blank save to foil Khench-Yakhav Enkhzorig. That paved the way for his team-mates to sew up the victory on 71 minutes through Hami, who raced onto Ikhsan’s clever first-time hooked pass to fire beyond the goalkeeper for a deserved goal. Following 1-1 draws against Hong Kong and eventual group winners DPR Korea, Singapore concluded the tournament in second place, two points behind Korea and fell short of qualification. Only the group winners and four best runners-up from the 11 groups qualify for the finals in Thailand next year. The team are due to arrive home tomorrow, 27 March. Singapore: Zharfan Rohaizad (GK), Lionel Tan, Irfan Fandi, Irfan Najeeb (Danish Irfan 90’), Zulqarnaen Suzliman, Joshua Pereira (C) (Saifullah Akbar 76’), Jacob Mahler, Syahrul Sazali, Hami Syahin (Arshad Shamim 88’), Ikhsan Fandi, Amiruldin Asraf. Unused subs: Kenji Rusydi (GK), Adib Nur Hakim (GK), Akram Azman, Nur Adam Abdullah, Amirul Haikal, Nur Luqman Rahman, Naqiuddin Eunos, Haiqal Pashia, Syukri Bashir.